1. Duell. This is the same as the classic En Garde with the addition of cards which change the rules for each round, but you can ignore those and play En Garde if you want. 2. Robot Master. This is a reskin of Dragon Master. Players make a grid of cards with one trying to score for rows and the other for columns. Both games have been played very little - Duell possibly not at all. Duell's rulebook has several languages including English. 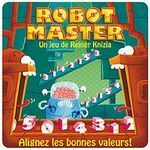 Robot Master is in French but a printout of the English rules is included (and there is no text on the cards).